Last week 14 year old Harry had a bit of a turn with a seizure or possible stroke. It left him all scrunched up. When his Mum Sarah from Hounds on the Downs sent me the Before picture everything about his posture suggested he needed some gentle stretching to ease his back and regain his confidence. I sent her some of our leg, back and neck stretches to try. 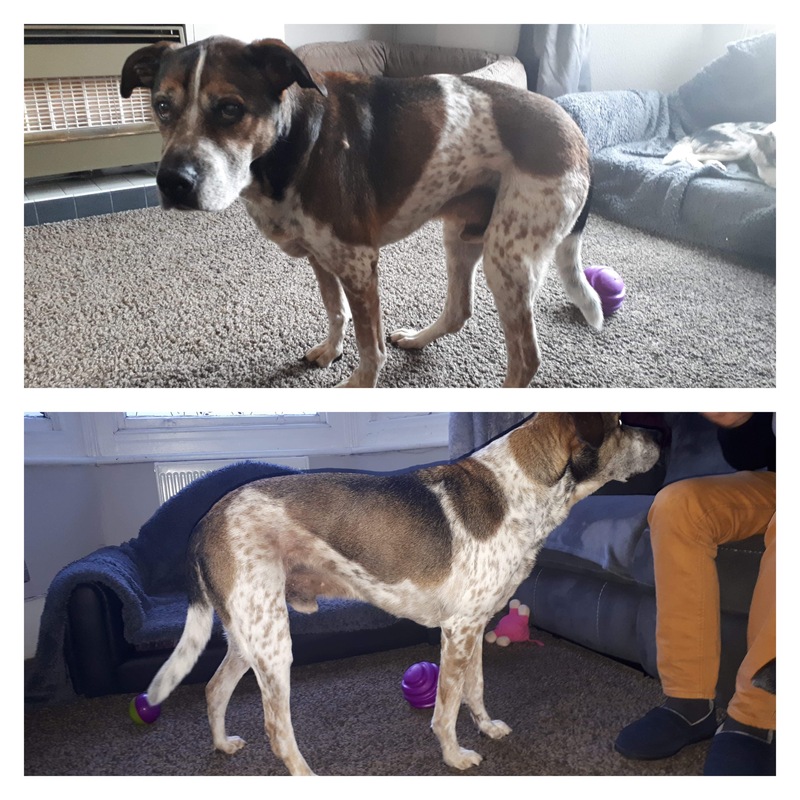 The After picture is after they have done some of these gentle exercises – nothing intrusive just asking him to lean forward with a treat inducer. In this way, he is stretching himself, all Sarah had to do was to hold the treat in front of his nose making sure he his alignment was longways which will, in turn, make his weight equally balanced right and left, his back is straight, and his eyes are looking forward to ensure proper cervical alignment. Harry’s favourite vet nurse, Jay from Coastway, has also been involved with his recuperation, showing Sarah where she needs to concentrate on Harry. There is still a way to go but Sarah said he is looking less wobbly and moving much more comfortably. This entry was posted in acheypaw, achy paws, AchyPaw, achypaw myotherapy, canine myotherapy, canine myotherapy, dog myotherapy, achypaw myotherapy, myotherapy, achy paws, Dog, massage benefits, multimodal, multimodal therapy for dogs, myotherapy, senior dogs, south coast dog massage, south coast myotherapy, therapeutic massage and tagged acheypaw, achy paws, achypaw, achypaw myotherapy, achypaws, Canine massage, canine myotherapy, Dog massage, dog muscle therapy, east sussex, south coast dog massage, south coast myotherapy. Bookmark the permalink.